Berlin, our guidebooks all tell us, effectively has two cities worth of museums, because it was two cities for such a long time. So even a full week is nowhere near enough to see them all. Nevertheless, we’ve decided to give it a good try, and today we visited three more museums, making a total of seven from our three days so far. We’ve become quite ruthless about speeding through museums. 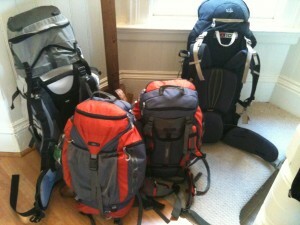 Travelling with children gives you a lower boredom threshold as a group than your average traveller. While I’d now back Callum and Declan against the average backpacker in quite a lot of historical knowledge areas (certainly they’d beat my 20 year old self in their understanding of Egyptian and Roman history), they do have a limit as to how many statues they are willing to stroll past. 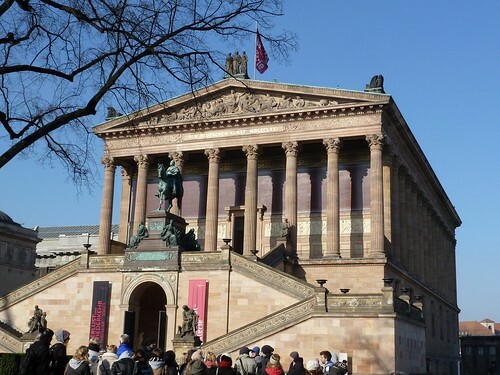 So today we visited the Alte Nationalgalerie and skipped one whole floor and half another one in our quest to see their French impressionist collection. 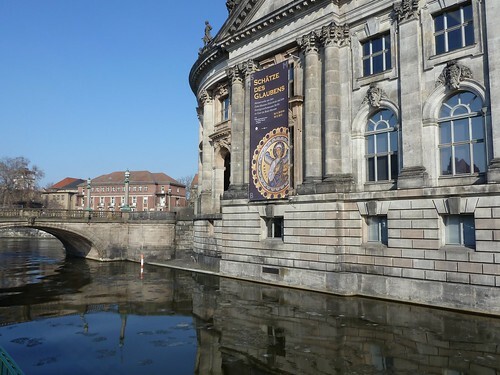 And then we skipped almost the entire Bode Museum to get to the special children’s exhibit on dragons and Heroes. In the Art Gallery, it turned out that the Impressionist painters (Monet et al) were not represented by their best work – so despite our determination to pick the eyes out of the museum we were often slowed down by some fantastic Germans of the same period that we had never heard of. I suspect many art museums around the world feel they must have a Monet, or Van Gogh, or Cezanne, but their best works aren’t really accessible any more, even to a museum of this stature. The Bode Museum exhibit was fun, particularly a puppet theatre where Callum directed and voiced a puppet show about St George killing the Dragon. But it gave me a new appreciation of some of the kids exhibits we have seen at our own Maritime Museum in Sydney, which are generally at least as good, and occasionally better. But we saved the best to last. 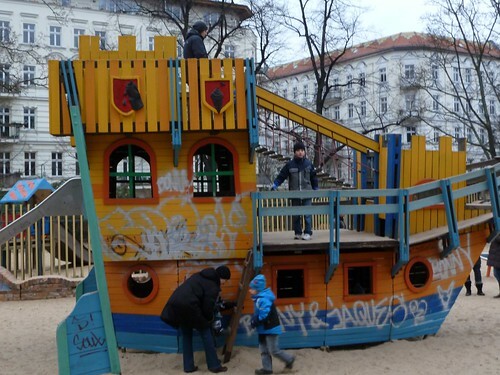 As befits a city of museums, Berlin has a few for children. It was hard to pick, from the information available, which would be best for non German speakers. So we tried the one within walking distance of home. The ground floor was mostly all in German. But the first floor had no language requirements and was almost entirely given over to a giant indoor climbing area, except for a small space that was (heaven!) an accompanying cafe for the grownups. Callum and Declan had a wonderful time, chasing each other in and out of the climbing rooms, with short stops for sustenance. 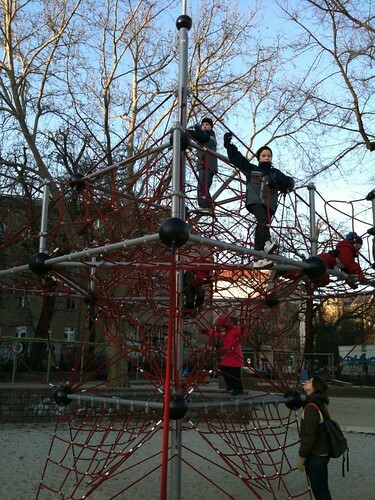 I should have expected a perfect playground inside a museum, as we have encountered them everywhere outside. Pretty much anywhere we have walked, we have managed to walk past a playground with equipment for the older kids to have a great time playing with (which our boys have to themselves as everyone else is at school). And so far, most playgrounds have had a coffee shop right next door.